Former Indiana senator Evan Bayh announced Wednesday he will run for his old seat in the U.S. Senate, facing current U.S. House Rep. Todd Young in November. Bayh will take over the Democratic side of the ticket after Baron Hill dropped out Monday. The two are running for Republican Sen. Dan Coats seat after he retires in January. Bayh served as governor of Indiana before spending 12 years in the Senate. EdWeek took a look at Bayh’s involvement in education legislation when he served in congress. Bayh, who left the Senate in 2011, joined a fight to help save Race to the Top, the federal competitive-grant program that was one of the early, signature education initiatives from President Barack Obama’s administration. Back in July 2010, for example, he joined 12 of his then-colleagues in the Senate in opposing budget cuts that would have stripped money out of Race to the Top and other administration priorities. The cuts approved by the House of Representatives and opposed by Bayh and fellow senators aimed to eliminate $800 million in federal spending—$500 million would have come from the $4.35 billion Race to the Top program, $200 million from the Teacher Incentive Fund (which backed teacher pay-for-performance programs), and $100 million from the charter school program. He was an ally of Sen. Michael Bennet, D-Colo., during this budget fight, in which Race to the Top funding ultimately prevailed. 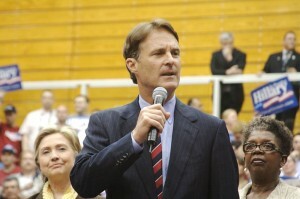 Bayh will be the Democratic nominee for the seat, pending approval by the state Democratic party on July 22.